After that, it’s all smooth sailing, as Coco proves to be another top-shelf effort from the Pixar factory. 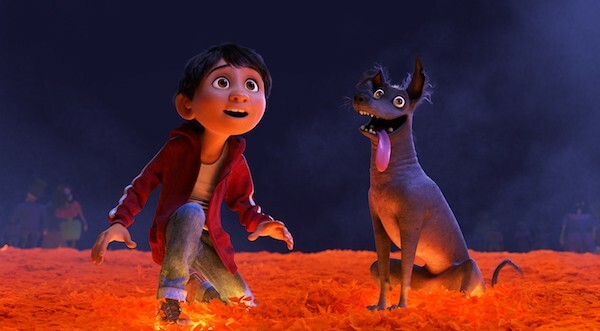 The fanciful story centers on Miguel (voiced by Anthony Gonzalez), a young Mexican boy who yearns to become a celebrated musician like his idol, the late singing star Ernesto de la Cruz (Benjamin Bratt). That’s quite the challenge, though, since his entire family hates music and has prohibited anyone within its ranks to ever pick up a guitar or a microphone. (The disdain traces back generations, to when Miguel’s great-great-grandmother was abandoned by her husband, who left to pursue his musical career.) Undeterred, Miguel goes against his family’s wishes, a decision that, through supernatural means, catapults him into the Land of the Dead. There, he not only has to contend with a hard-luck layabout named Hector (Gael García Bernal) but also with his deceased ancestors, all of whom also forbid him from becoming a musician. Coco opens by following the traditional toon template of a person following their dreams against all odds, but once Miguel reaches the Land of the Dead, the movie deepens in satisfying and even unexpected ways. Interpersonal relationships take some surprising turns, and the story’s metaphysical slant (particularly the notion that a person doesn’t truly disappear until no one remembers they ever existed) lends the proceedings a haunting and ruminative air. All of this is played out with Pixar’s usual attention to engaging characters (dumb dogs are always a reliable addition, and here we get Dante, a street hound with a tongue longer than that of Kiss’s Gene Simmons) and cutting-edge animation that is ofttimes jaw-dropping.